Decorate Your Cake & Cupcakes! Welcome/Door Sign- Welcome sign measures 10″x10″. It is made on textured layered cardstock and is hung with coordinating ribbons. Banner- Banner reads Happy (age) Birthday with images on both ends. It is made on textured layered cardstock. Each scalloped circle measures 5″ across and are tied together with coordinating ribbons. Favor Tags- Favor tags are made with textured layered cardstock with matching ribbon to tie around any favor to send your guests home with. Each favor tag measures 3″. 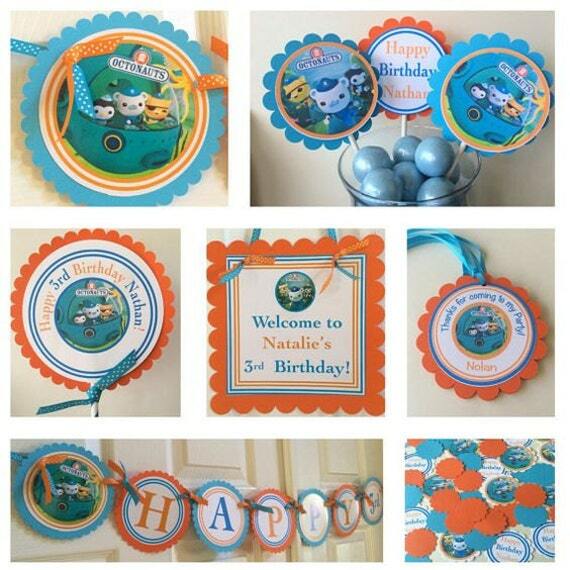 Cupcake Toppers- 12 personalized cupcake toppers with name. Each topper is 3″ wide and 6″ tall. Each topper is made of textured layered cardstock with a scalloped edge. Includes (16) paper dinner plates, (16) paper dessert plates, (16) 9 oz. 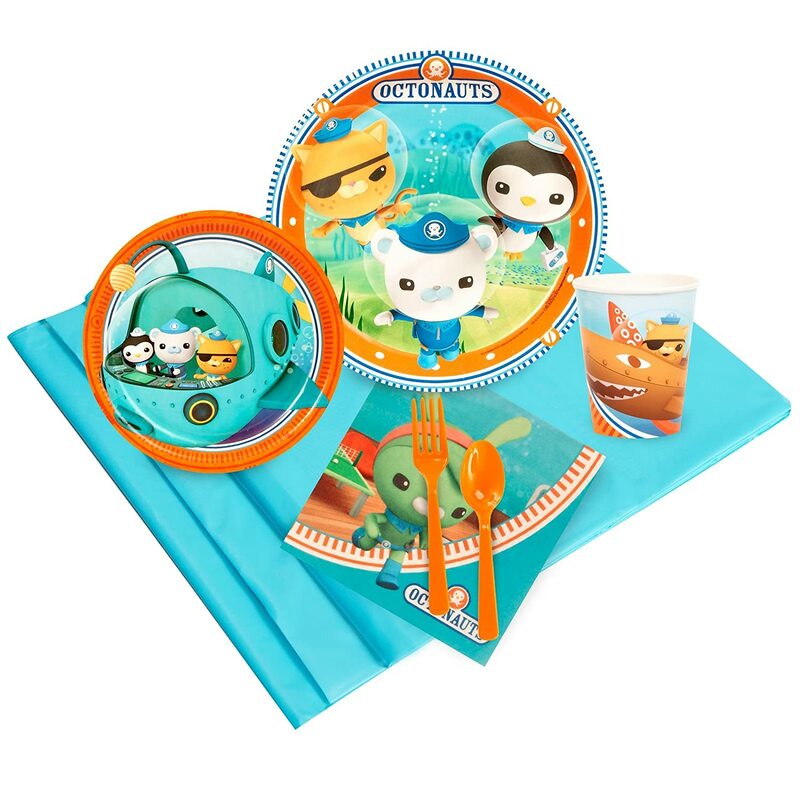 paper cups, (40) 2-ply paper lunch napkins, (16) sets of plastic forks and spoons, and (1) plastic tablecover. 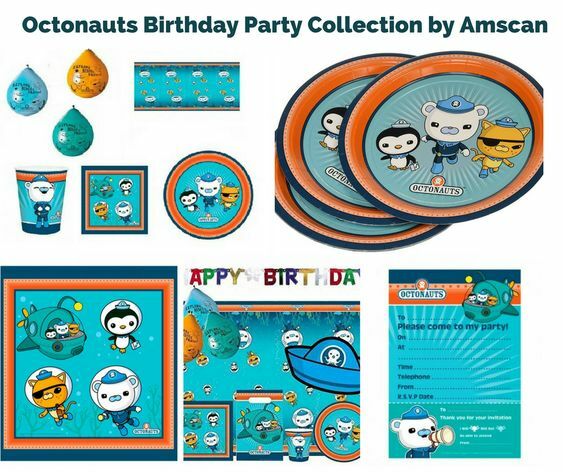 Add matching tableware, favors, accessories, or a party kit bundle to complete your Octonauts birthday party! Includes (24) paper dinner plates, (24) paper dessert plates, (24) 9 oz. 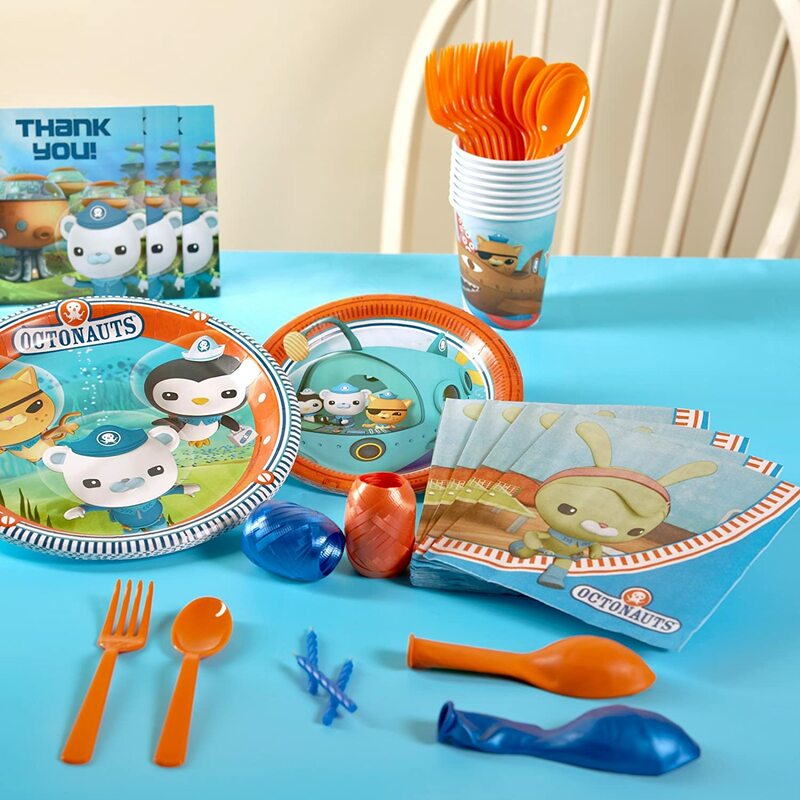 paper cups, (60) 2-ply paper lunch napkins, (24) sets of plastic forks and spoons, and (1) plastic tablecover. Includes (8) paper dinner plates, (8) paper dessert plates, (8) 9 oz. paper cups, (16) 2-ply paper lunch napkins, (8) birthday party invitations, (1) plastic tablecover, (8) sets of plastic forks and spoons, (24) candles, (12) latex balloons, (2) rolls of curling ribbon, and (1) roll of crepe paper. 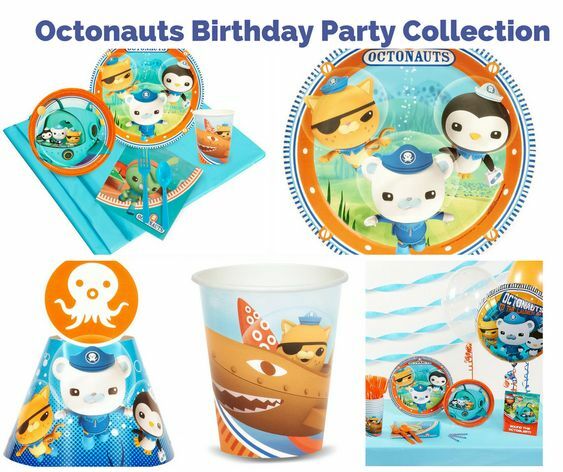 Set-up your Octonauts party with ease using this all in one party pack.Includes (16) 9-oz. paper cups, (16) dessert plates, and (20) beverage napkins. This is an officially licensed The Octonauts product. 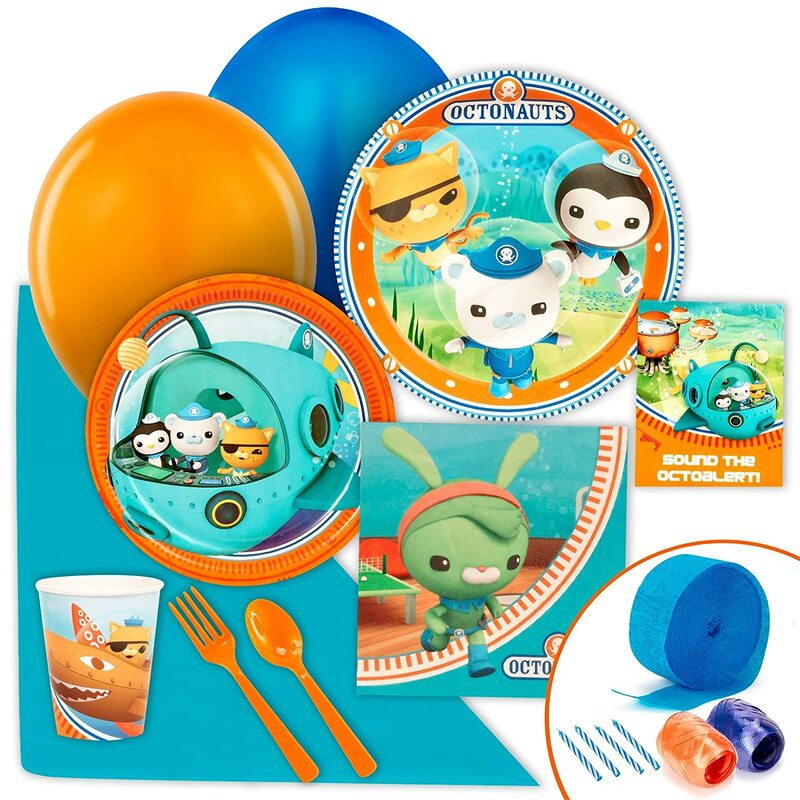 Everything you need to throw the perfect Octonauts Party is included in this pack!The Octonauts Party Pack for 32 includes: (32) Octonauts Dinner Plates, (32) Octonauts Dessert Plates, (32) Octonauts 9 oz. 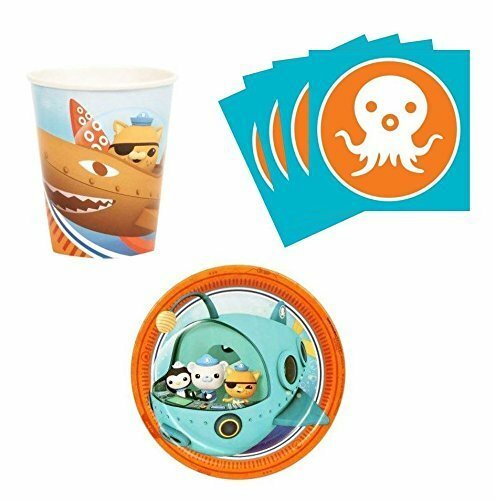 Paper Cups, (60) Octonauts Lunch Napkins, (96) Aqua Blue Forks and Spoons (32 of each), and (1) Bermuda Blue Plastic Tablecover. Please note: One or more of the items included in this party pack may be substituted with an item of similar quality due to availability. Includes (8) paper dinner plates, (8) paper dessert plates, (8) 9 oz. paper cups, (16) 2-ply paper lunch napkins, (8) sets of plastic forks and spoons, and (1) plastic tablecover. Includes (8) paper dinner plates, (8) paper dessert plates, (8) 9 oz. paper cups, (8) sets of plastic forks and spoons, (20) lunch napkins, (1) plastic tablecover, (12) latex balloons, (2) rolls of curling ribbon, (16) candles, and (8) thank you notes.